The 590-ha-project is currently undergoing several studies and procedures. Yet it is not clear when construction of the power plant will begin nor whether Photon Energy oversees installation of the panels. Amsterdam-based Photon Energy N.V. is currently developing a PV power plant with a total output of 316 MW in the Australian state of New South Wales. Currently the 590-ha-project is going through procedures concerning permitting and grid connection of the solar power plant, the Dutch power solution provider announced on Tuesday. At the request of pv magazine, company spokesman Jan Krcmar reported that the undertaking of studies and the permitting process in Australia would last much longer, continuing maybe for some years yet. With the operator of the major high voltage transmission network in New South Wales and the ACT, Transgrid, a grid connection process is underway for the design of a substation for approximately 300 MW AC to be connected to the operator’s 330 KV network. After completion of the planning work, Photon Energy will decide whether the construction will be taken over by the company or the project will ultimately be sold, Krcmar confirmed. It is also possible that the project developer will undertake the operation and maintenance of the PV system. Photon Energy has been operating in Australia since 2011 where it has been active mainly in the construction of PV rooftop systems. 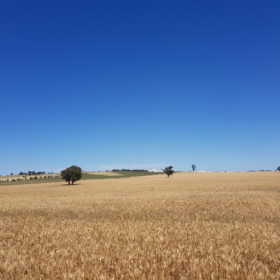 According to the solar power solution provider the project near Gunning is one of the largest planned in Australia so far. In addition, the company is currently developing two PV power plants with a capacity of 19 and 20 MW each. Photon Energy plans to build these two solar systems for portfolio purposes, Krcmar concluded.